"There's no Prince Charming of jobs," Tuennerman said to marketing students, her tone matter of fact, as she took the stage this year as keynote speaker of UNO Marketing Week, an annual speakers' series held each year at the University and hosted by the UNO Marketing Department. "I took the worst job in the best company," Tuennerman said of her early career years. Since then, she told students, she has worked like a duck, sailing smoothly across the surface while paddling furiously beneath the water. 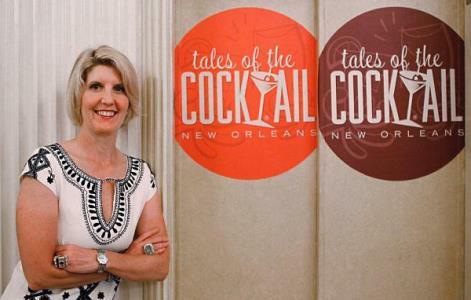 Tuennerman, who graduated from the University of New Orleans College of Business Administration with a Bachelor of Science degree in Marketing in 1986, is founder and executive director of Tales of the Cocktail, billed as the world's premier cocktail festival, which draws thousands of cocktail professionals and enthusiasts to New Orleans each year. She provides the vision and strategic direction for each year's festival, working directly with mixologists, bartenders, spirits brands and media outlets to bring each of the festival's 200-plus events to life. "You can never have too much experience," Tuennerman advised marketing students during Marketing Week 2013, as she described how she created a team of international marketing experts and mixologists that works together throughout the year to organize the festival now entering its 13th year. Her team manages 302 brands, designs a scintillating set of more than 60 seminars and more than 200 events devised to draw industry leaders from around the world; creates a "cocktail apprentice program" and manages the Spirit Awards, given at each year's festival. An annual study conducted by the University of New Orleans Hospitality Research Center shows that Tales of the Cocktail brings an annual economic impact of more than $14 million to the city of New Orleans, Tuennarman said, citing research. The Hospitality Research Center in the College of Business Administration is a collaborative effort of the University's Lester E. Kabacoff School of Hotel, Restaurant and Tourism Administration and Division of Business and Economic Research. It is focused on producing high-level market research and identifying industry best practices; it's the premier hospitality and tourism research center in the nation. Moreover, under her leadership, Tuennerman's team published a book, Tales Of The Cocktail From A To Z, to commemorate the festival's 10th anniversary in 2012. The book, sold online and in local markets, helps to reinforce the brand, she said. Tales of the Toddy, now entering its ninth year, helps New Orleanians each year to get into the holiday "spirit." The annual holiday party held downtown each December features expertly crafted yuletide cocktails, excellent cuisine from local restaurants and live music. A 2013 Young Leadership Council of New Orleans Role Model, Tuennerman and her husband Paul also run the New Orleans Culinary & Cultural Preservation Society, a nonprofit organization committed to preserving the unique culture of cocktails and cuisine in New Orleans and beyond by funding apprenticeships, grants, scholarship programs and more. She has received the BNIC Cognac Personality of the Year Award and the prestigious D'USSE Cognac Tom Bullock Award for Service and Leadership from DC Toasts. Her work has also garnered a number of local, national and international awards and has been featured in CityBusiness, Gambit and More magazine. Tuennerman advises UNO marketing students to develop their own brand and from the start of their careers be responsible, seek out mentors, be nice, be prepared, be realistic and "specialize in something," she said. "Own some piece of real estate in somebody's mind."